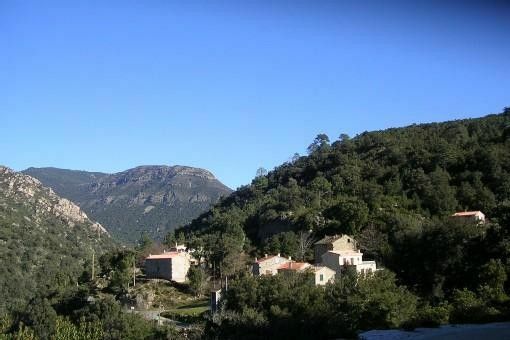 Picturesque hamlet of Bura, medium mountain between peaks and sea, in valley of the torrent U Travo, in the heart of the Regional Natural Park of High Corsica. Note: animals are not accepted. Impregnable view on environment of summits, valleys, maquis, torrent. Big brightness, intense nature. Activities: walking hikes, 'via ferrata', torrent bathing, canyoning, discovery tours, mountain biking, water sports on nearby coastline. Quick access to Ghisonaccia, Bavella, Porto Vecchio, Bonifacio, Corte. - Chapter General equipment ': the hiking maps (IGN covering the entire region) are provided free of charge upon request and must be returned at the end of the exit. What a wonderful stay we had! The house is lovely, very well cared for and well equipped in a beautiful quiet spot with a lovely view of the hills round about. There’s a river nearby perfect for wild swimming and the stars at night are spectacular. And such a warm welcome from Lucienne and Guy when we arrived! Haute Corse, buttress Oriental along the Tyrrhenian Sea, in the heart of the Regional Park. Hamlet common Bura Chisa, accessible by the CD 645 going up the valley of the U Travu 'by a scenic road on the mountainside.